Arguably, the 1980’s was the era of the film franchise. Ghostbusters, Gremlins, Indiana Jones, Back to the Future, Batman, The Karate Kid; the list of classic 80’s film franchises could go on and on. Today, there’s constant chatter about franchise reboots because, well, let’s face the hard truth—all the best ideas were done in the 80’s. Enter Bill and Ted. In 1989, Orion Pictures released Bill & Ted’s Excellent Adventure, a buddy flick about two time-traveling, slacker metalheads who are destined to bring forth a utopian society. It was really dumb, a lot of fun, and no one expected it to do well. Bill & Ted was a surprising success, spawning a short-lived animated series, a couple of comic books, some video games, and a slightly less successful second film in 1991, Bill & Ted’s Bogus Journey. After that, there was silence from the franchise, and that was OK with everyone; some franchises aren’t meant to last forever. Until now, that is. Boom! Studios has been on a tear with licensed properties from the 80’s, publishing comic adaptations of Big Trouble in Little China, Escape from New York, Aliens, and Robocop. 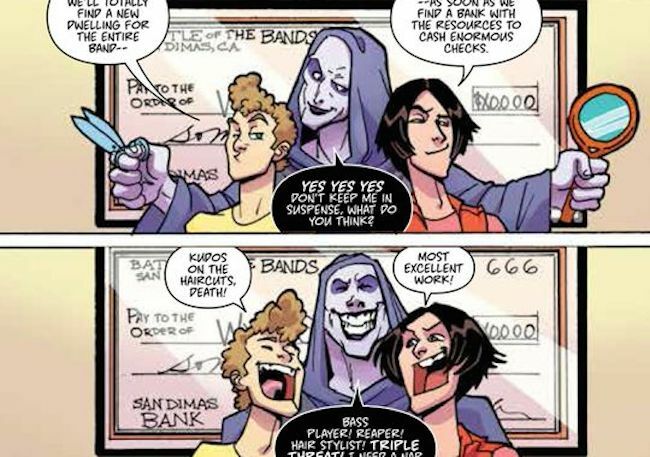 Continuing that streak, they’ll be releasing Bill & Ted’s Most Triumphant Return, a 6 issue mini-series by Bryan Lynch and Jerry Gaylord that picks up right where Bogus Journey left off. Jumping right into the ending of Bogus Journey without any setup creates an immediate problem, because it assumes prior knowledge of the characters and the plot thus far. Even something as simple as a recap page on the inside cover would’ve gone a long way towards creating a sense of familiarity. It’s not unreasonable to expect a first issue to be a good pick-up point for new readers, and as an introduction to the franchise, Most Triumphant Return is a mess. In the first few pages, characters appear without any context or introduction, as Lynch assumes that people might possibly remember details from a franchise that’s been dormant for nearly 25 years. Without the aid of Wikipedia, it’s actually impossible to tell what’s going on in the book and who’s who. 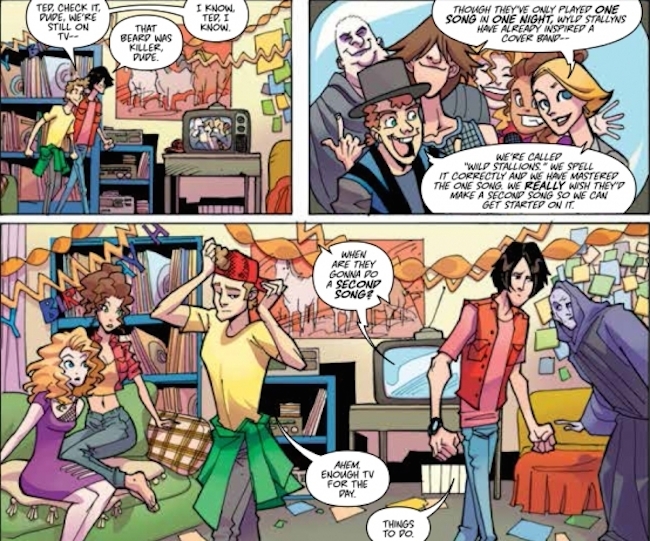 Bill and Ted are given flimsy motivation for going back in time. They’re living a utopian life, they have everything they could possibly want, and there’s no external threat presented in this first issue. With nothing really at stake, there’s no reason to care about what happens to the protagonists, and consequently no reason to bother reading the book. Jerry Gaylord is probably a fine comic book artist, but it’s hard to tell in this case. A large part of being a good illustrator is being able to visually convey a story. Gaylord does the best with what he has to work with, but there just isn’t much story here. The characters are all on model, the style is appropriate, and there’s nothing that looks “off,” but there’s also nothing there artistically that’s worth noting. Gaylord showed up to work, and did the best job he could with what he was given. Smaller publishers like Boom! rely on licensed properties to subsidize their publisher-owned releases, which is why you see so many of them on the market. When a licensed property has a strong, or even cult, following, all they need to do is throw a well-known, talented creative team behind it, and the book will sell. What makes Bill & Ted an odd choice is that it never really had that sort of appeal beyond its initial shelf life. That’s not to say that injecting some fresh life into the franchise isn’t possible, but it’s a tough job that Lynch and Gaylord don’t deliver on.